A few days ago, I waited on a woman who warned me of her severe cinnamon allergy. Cinnamon?! I’ve been in the service industry for a loooooong time and that was a new one for me. I was immediately struck by how tragic it would be, especially this time of year. I’m sneaking cinnamon into everything I make, from chocolate cookies to my latest braised beef, and loving every moment of it. 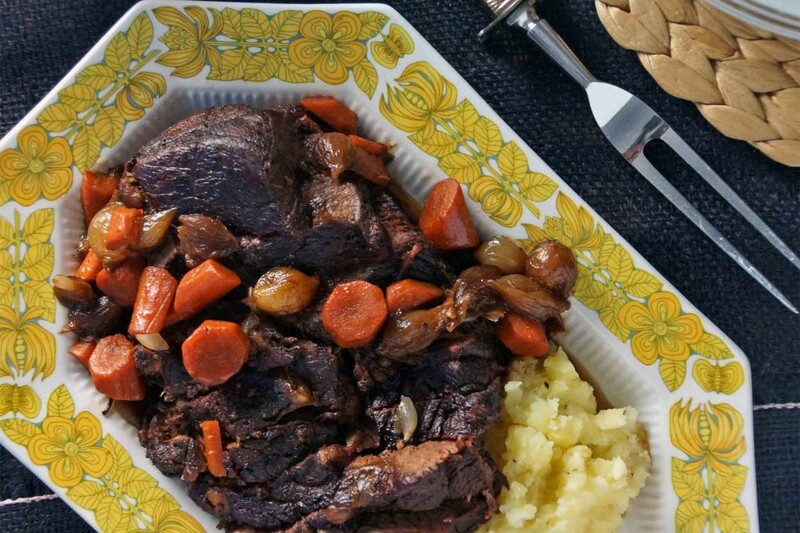 This is a beef roast inspired by a beef stew I had in Belgium. 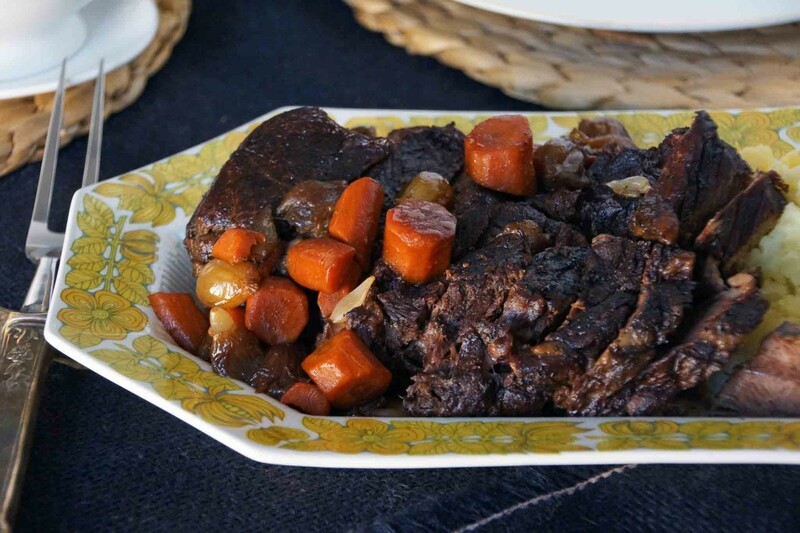 It’s a chuck roast that has been braised in a dark, chocolatey stout with orange peel, cinnamon sticks, and cloves. It’s dusky, spicy, and tastes exactly as December should. Matt and I ate it on a quiet night in, but I wouldn’t hesitate to serve it for any winter/Christmas dinner party, provided no one on the guest list has a cinnamon allergy. Make a pass through the fridge and your spice drawer and grab everything you need: a chuck roast, good stout or porter, carrots, onions, tomato paste, cinnamon sticks, cloves, orange peel, and even a little cocoa powder. Start by wrapping the orange peel and spices in a little bundle of cheese cloth. 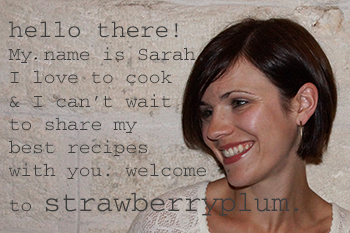 Now the inedibles will be easy to remove and you won’t have to subject your guests to choking on a whole clove. Sear the meat then take it out of the pot and start building your braise. Sauté carrots and onions until slightly softened. Add a dollop of tomato paste and a sprinkle of cocoa. Now add the beef back to the pot and tuck the spice bundle alongside. 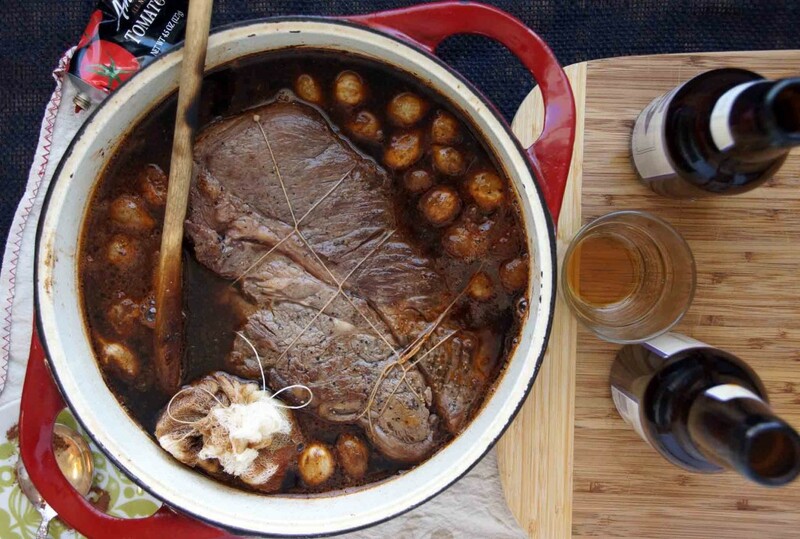 Pour in a combination of stout and stock to almost cover the roast. Get it back on the stove and let it bubble away until the meat is tender and your home smells like the holidays. When the meat is just right, pull it out, slice, and transfer to a serving platter. While you’re doing that, crank up the heat and reduce the braising liquid to spoon over the beef. Call your guests to the table, that is if they’re not already there, gazing longingly at your glorious roast. Secure the roast with kitchen twine so it says in 1 piece while braising. Season liberally with kosher salt and black pepper. Heat about 2 Tbsp. olive oil in a Dutch oven over medium-high heat and sear the beef on all sides, about 10 minutes total. Remove the beef and transfer to a large plate. While you are searing the meat make a "bouquet garni" to hold the herbs and spices. 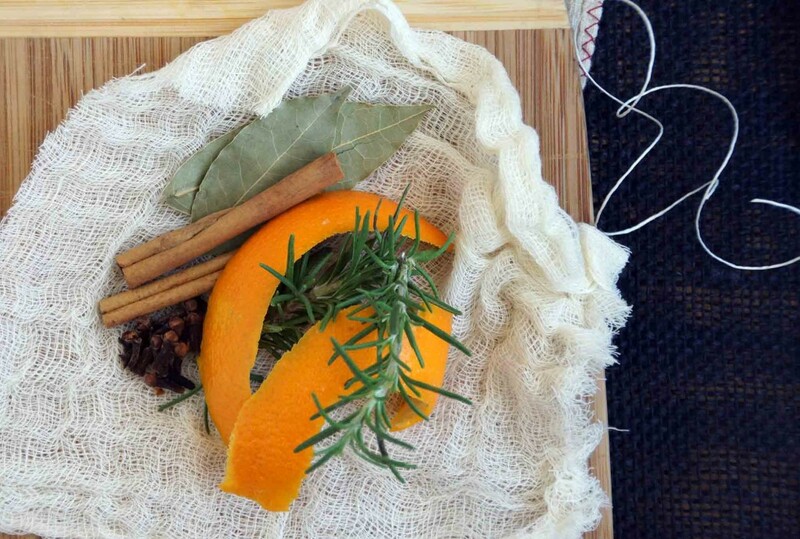 Place the bay leaves, rosemary, orange peel, cinnamon sticks, and cloves in the center of a square piece of cheesecloth. Pull the corners together and tie with a piece of kitchen twine. Set aside. Now start "building the braise" in the pot you used to sear the meat. If there is a lot of fat left in the bottom, drain some off; if there isn't enough, add a little oil--you just want a thin coating on the bottom. Add the carrots and onions, season with a pinch of salt, and sauté until the carrots just begin to soften, about 5 minutes. Clear a spot in the pot and drop in the tomato paste, letting it cook and darken before stirring it into the vegetables. Sprinkle the cocoa over the vegetables and stir to combine. Add the seared beef back to the pot and tuck the "bouquet garni" alongside. Add the stout and enough stock to almost cover the meat. Bring the liquid to a boil, then reduce to a slow, steady simmer. Cover the pot and simmer for 2 hours, flipping the meat once or twice. After 2 hours, remove the lid so the liquid has a chance to reduce a bit, and continue to simmer until the meat is very tender when poked with a fork, about another hour. 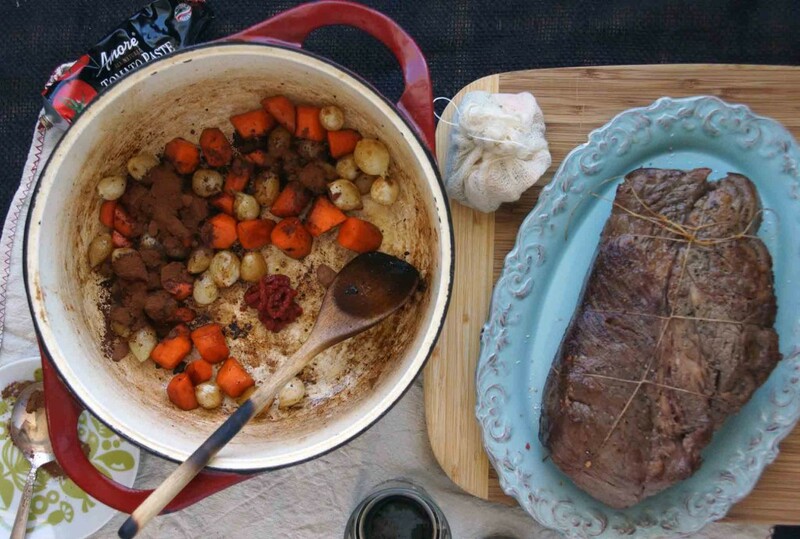 Transfer the meat, carrots, and onions to a cutting board and tent with foil. Remove the "bouquet garni" and bring the braising liquid to a rapid boil. Boil until the liquid has reduced by about half. Skim the fat off the top. Taste and season, if needed, with salt and pepper. 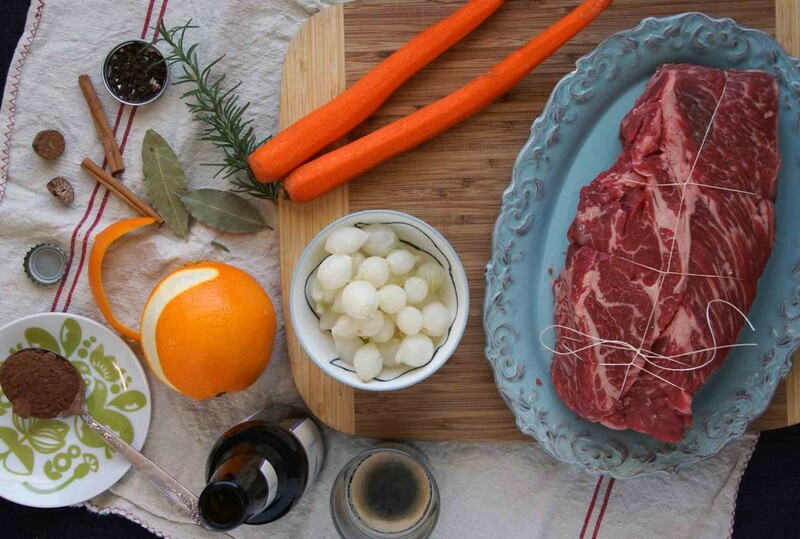 Slice the beef against the grain, arrange on a platter, and spoon the reduced braising liquid over the top. 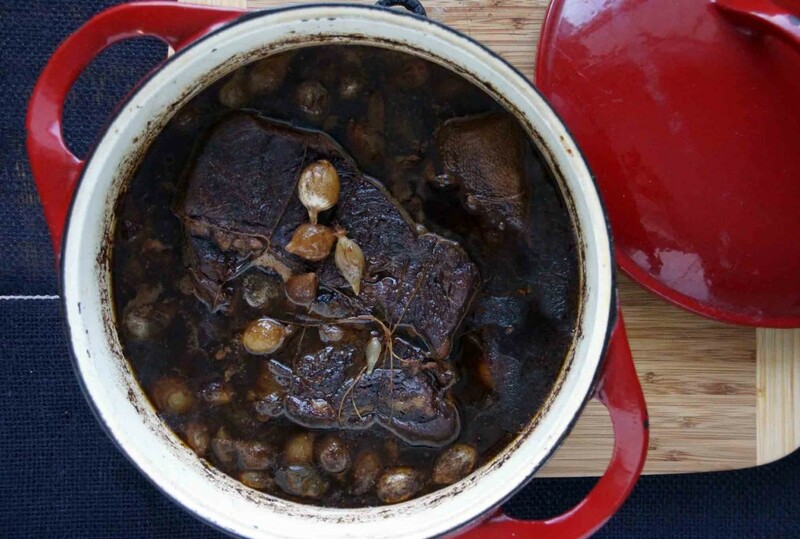 The remaining braising liquid can be passed at the table.